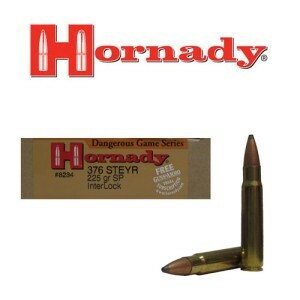 Designed as a joint venture between premium rifle maker Steyr and famed ammo manufacturer Hornady, 376 Steyr ammunition was designed with a purpose. The purpose was to provide a powerful round in their lightweight Steyr Scout rifle. The 376 Steyr is a 9.3 x 64mm round that falls just under a long action cartridge. This standard length rifle was designed for both tactical operations as defined by Colonel Jeff Cooper with his scout rifle concept as well as hunting applications.